Riding as part of a women's group is great fun. 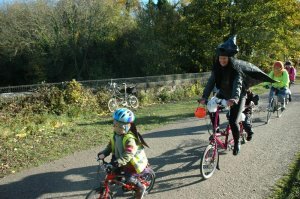 In partnership with Carsington Sports and Leisure, Monsal Trail Cycle Hire and the Peak District National Park Authority, Derbyshire Dales District Council launched a series of weekly, women-only bike rides led by a trained leader on safe, local trails. We talk to the Dales District Council's Active Everyone Project Coordinator, Marie Widerman who is an assistant Breeze ride leader. Derbyshire Dales District Council wanted to develop cycle rides so it made sense to link up with British Cycling's Breeze. It's a great initiative and the volunteers are really good and very dedicated. We launched rides in the Carsington Water and on the Monsal and Tissington Trails – all focused on beginners. Two leaders are better than one! On Breeze rides you have two leaders so you're able to cater for the whole group. No-one is ignorant of other people's levels in the group - you're aware if it's only someone else's second week. If one part of the group wants to go a little quicker, you can do that. If someone needs to stop for a quick drinker or needs go a bit slower or you've got someone who's perhaps never cycled before, that's fine too as the other leader can drop back and stay with them. It may sound stupid but even though the trail is really flat, there is still a slight incline. Often I think it's taken for granted that people understand about brakes and gears but that's not always the case. Breeze rides give you the chance to learn about using your gears and how to brake. You also learn how to ride in a group – how to keep your balance and not get too close to other riders. Often people want to have their seat a bit lower than the optimal position because they feel more secure being able to put their feet flat on the ground. That's fine - it's all about building people's confidence. 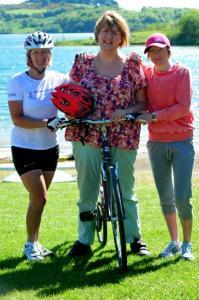 A couple of ladies who come along are both retired professional women who wanted to get more active. They play bowls and tennis and wanted to increase the range of activities they do so they don't get bored. The social side of Breeze rides is massive. It's interesting that no-one does the ride and leaves at the end. Everyone stays for a cup of tea. It's such a good opportunity to meet people. Get confidence to go out unaided. It gives you the confidence to go out on your own. But everyone has worries – for example about getting a puncture and getting stuck on the side of the road in the rain. I like riding on the road and bought myself a road bike last year. I've only just bought clip-in road shoes and at first they were a bit tight so I was fighting to unclip from my pedals and I was worrying about falling off when I got to a junction. I was a little bit worried about it beforehand. I could ride but I'd never been a member of a club. So I didn't know what to expect but I really enjoyed the course. We had a fairly big group in the morning with a classroom session before we went out. In the afternoon we split up into two smaller groups. It was very relaxed – we talked through everything and you were given the opportunity to repeat something if you needed to. As a leader you have to be competent at signalling and stopping and manoeuvring up to the front so you've got two leaders at the front when you are coming up to a junction. It has definitely made me more confident as a cyclist. A lot of it is common sense but it gave me reassurance – I know when it's my right of way. You find that a lot of drivers will try and bully their way past you. It's ignorance really. The course definitely reassured me. You also learn how you how to check your bike so it's road worthy – going over the frame, pedals, wheels etc. There's places to stop off and rest. We always say it's relaxed and social. Yes, you're out there on a bike but that's the fun part. It's taking your mind off the fact that you're doing exercise. If you fancy it come and give it a try. Don't worry about your level of fitness or skills. What kit you wear doesn't matter as long as you're comfortable. People turn up in jeans and all sorts of clothes. Remember, it's recreational - we're not racing! Local women can select their location every Monday, Tuesday and Wednesday from 10 to 11am. 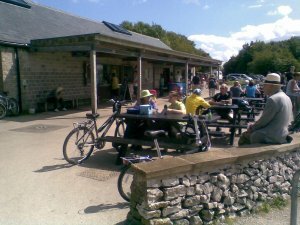 On Mondays, riders meet at Hassop Station, on Tuesdays it's Carsington Water and on Wednesdays, the starting point for the Tissington Trail is Ashbourne Cycle Hire. Small children are welcome. Don't have a bike? Don't worry. 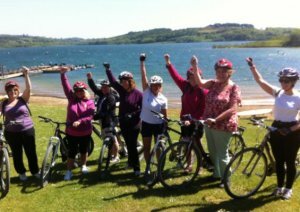 The Peak District National Park Authority is offering a discount for ladies attending Breeze rides* from their three Peak District Cycle Hire centres at Ashbourne, Carsington and Parsley Hay. Special two-hour Breeze hire rates: £6 for an adult cycle (normally £9); £4 for a child's bike / buggy / tag-along; £2 for a baby seat. Please note it is advisable to book in advance. Buggy/tag-along can be attached to your own bike, if suitable. Babyseats only available on hire bikes.